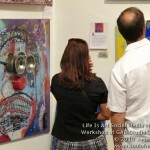 Life Is Art Social Media Marketing Workshop at GAB Studio on Saturday, August 21, 2010. Â Â This was an in-depth 4 hour workshop with Patrick Barbanes, â€œThe Branding Professorâ€, Â teaching how to use social media to promote and brand yourself and your work. Â In this hands-on session for artists, we learned the Why and the How of putting you and your art online.